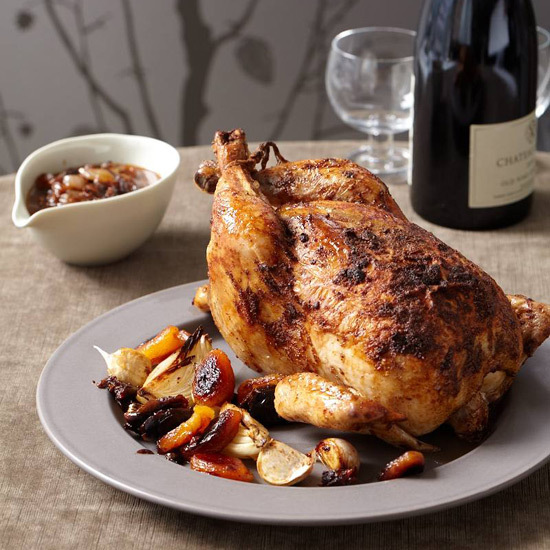 A roast chicken can look gloriously burnished on the outside and still not be fully cooked near the inner thigh. Here are three ways to know when your chicken is ready to serve. A roast chicken can look gloriously burnished on the outside and still not be fully cooked near the inner thigh—the last place the heat of the oven reaches. Here are three ways to know when your chicken is ready to serve. The most foolproof way to know when a chicken is done is to insert a well-calibrated instant-read thermometer into the meat near the inner thigh (between the leg and the breast, but make sure you’re not hitting bone). If the thermometer reads between 160° and 165°, it’s done. If the temperature is lower, it needs more time in the oven; much higher, and it’s overcooked. Don’t panic—just use the pan juices to help moisten any dry meat. No thermometer? Or don’t trust the one you own? Try this: Slice the skin between the leg and the breast and peek at the juices. If they’re clear, the chicken is likely done. If they’re just slightly pink, try the next test. When the chicken is cooked, the meat should feel firm rather than jiggly or rubbery. Ideally, it should also not be tight (a sign of overcooking). When you’re peeking at the juices near the inner thigh, check out the meat. If it looks like it’s undercooked, roast the bird longer. Or, if you prefer, cut off the legs and throw them back in the oven while you carve the breast.